Arsenal manager Arsene Wenger believes his decision to resist buying a new striker during the last summer transfer window has been justified by Theo Walcotts performance in the central position. The Gunners were the only club in Europe's top five leagues not to sign an outfield player in the last window. 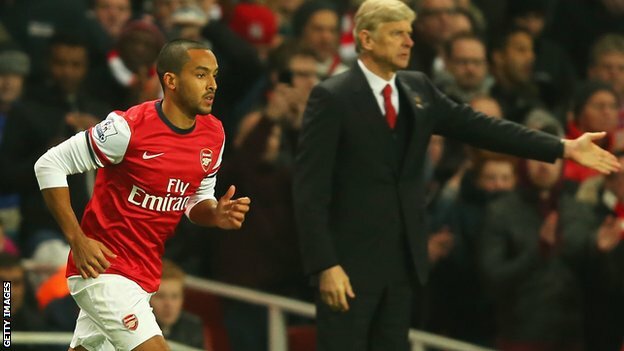 Instead, Theo Walcott has been moved from the wing to a more central role and has scored four goals in 11 games. "Theo looks always dangerous in this position. The quality of his movement is outstanding and he has found his finishing again," said Wenger. Frenchman Olivier Giroud has not started a league game since the draw against Liverpool on 24 August, while Danny Welbeck has been ruled out until January. "So sometimes you have to have strong beliefs and show the players as well that you believe in them in that position. "I always said that he will play through the middle and he got his knee injury when he played well through the middle against Tottenham. It took him a while to come back, I must say."